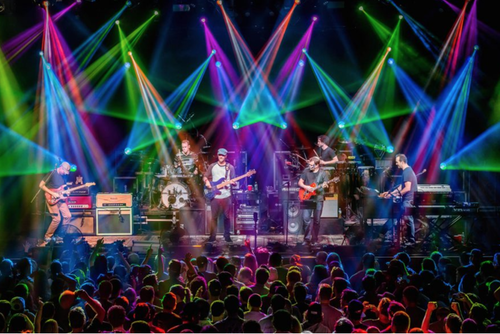 Umphrey's McGee have had an impressive career – performing in more than 100 concerts annually for 17 years, producing eight studio albums and online sales of over 3.5 million, it's no wonder fans across the globe get excited when this bands in town! Prepare yourself to be blown away by their monumental light displays and proficient musical ability in this groundbreaking performance at Red Rocks! Get ready as they hit the stage LIVE on Friday 21st June 2019 – at the Red Rocks Amphitheater! Umprey's McGee have a rare, experimental sound which cannot be pigeonholed. After just 8 months together, the band released their ironically titled debut album Greatest Hits Vol. III in 1998. By the tail end of that year, the band had released their first live album, Songs for Older Women, and had adopted a large following in their local area, playing at house parties and colleges. Over the years they honed their improvisational skills and started playing further afield, making a name for themselves as a dynamic, prolific band with a dedicated following. "Bayliss stepped up to the mic for what we thought was going to be some message about how happy they are to be in Colorado or to thank the crowd, yet instead, he said the four words that nobody knew they wanted to hear so badly. “You guys wanna rock?” and Umphrey’s proceeded to do just that."